This week, AMD released Radeon Software Adrenalin Edition 18.2.3, a smaller patch bringing support and/or performance optimizations for three new games: Final Fantasy XII The Zodiac Age (released 2/1), Brass Tactics (released 2/22), and Sea of Thieves (semi-closed beta from 2/23 to 2/25, full release on 3/20). The 18.2.3 driver also resolves a number of longstanding FreeSync and Overlay bugs, as well as brings bugfixes for Fortnite, Middle Earth: Shadow of War, and For Honor. With Sea of Thieves and Final Fantasy, AMD is citing performance gains from their internal testing compared to 18.2.2. On Sea of Thieves, AMD is claiming the Radeon RX Vega 64 is up to 29% faster at 4K, with the Radeon RX 580 is up to 39% faster at 1080p. For Final Fantasy at 1440p, AMD is claiming the Radeon RX Vega 56 is up to 13% faster, and the Radeon RX 580 as up to 20% faster. 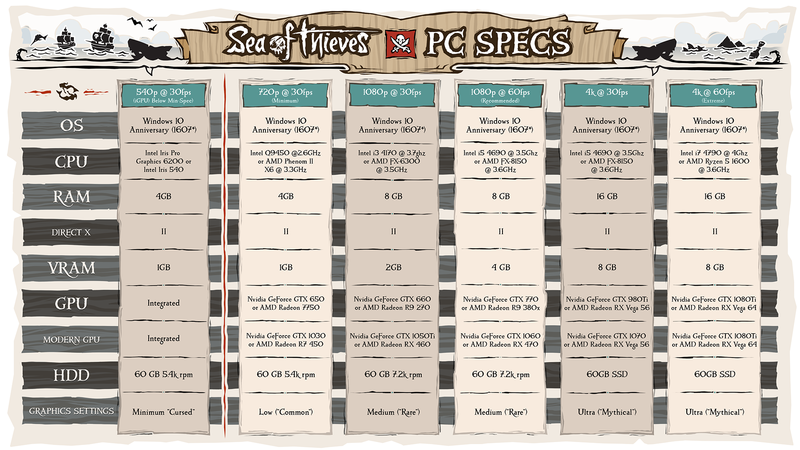 As far as game specification requirements go, Sea of Thieves developers Rare published a rather thorough chart earlier this month. For AMD GPUs the developers are looking at RX Vega 64 for 4K60 and RX 470 for 1080p60. While the full release is still around a month out, Rare has been conducting various closed betas; this weekend (2/23 to 2/25), the company is holding its second Scale Test, open to Xbox Insiders and those with access to the Closed Beta. Another beta is planned closer to the launch date. Fortnite: May experience lighting or fog corruption on some graphics quality presets. Middle-earth: Shadow of War: May experience an application crash when launched as a Universal Windows Application. For Honor: May experience an intermittent application crash on launch. FreeSync intermittently engages during Chrome video playback incorrectly, resulting in playback flicker. FreeSync may rapidly change between min and max range when enabled causing stutter in fullscreen games on multi display system configurations. When Enhanced Sync is enabled on some FreeSync connected displays, flickering occurs with the performance metrics overlay. Destiny 2 may experience an application hang in the mission “Heist” on some Radeon GCN 1.0 products. To note, 18.2.3 is not applicable to APUs; the inaugural WHQL “Radeon Software for Ryzen Desktop Processors with Radeon Vega Graphics” remain the most up-to-date drivers for the newly released Ryzen 5 2400G and Ryzen 3 2200G. Meanwhile, AMD has updated their support page on system boot-up failure with some Ryzen 2000-series APU desktop processors on AM4 motherboards: the boot kit consists of a loaned A-series Bristol Ridge processor with heatsink-fan, with the processor to be returned after the motherboard has been updated to the latest BIOS with APU support. The updated drivers for AMD’s desktop, mobile, and integrated GPUs are available through the Radeon Settings tab or online at the AMD driver download page. More information on these updates and further issues can be found in the respective Radeon Software Adrenalin Edition 18.2.3 release notes.